How do I say I miss you in a way that will make your heart ache as mine does? 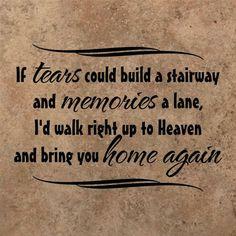 If TEARS could build a stairway and MEMORIES a lane, I would walk right up to HEAVEN and bring you home again. Call it peace or call it treason. Call it love or call it reason, but I'm not marching anymore. My whole world begins and ends with you, because my home is wherever I'm with you. I miss you dear. I thought of you everyday. I thought about you yesterday, and days before that too. I think of you in silence, I think of you in day and night. I often talk about you. All I have are memories of you and some of your belongings. Your memory is a keepsake for me, from which I'll never part. God may had you in his arms. But I have you in my heart forever. Missing someone is a part of loving them. If you're never apart, you'll never really know how strong your love is. When you miss someone, you start your day and end your day with the thoughts of that someone. Absence diminishes small loves and increases great ones, as the wind blows out the candle and fans the bonfire. Distance never separates two hearts that really care, for our memories span the miles and in seconds we are there. But whenever I start feeling sad because I miss you I remind myself how lucky I am to have someone so special to miss. When you miss someone, every song you hear seems to be written and sung with them in mind. 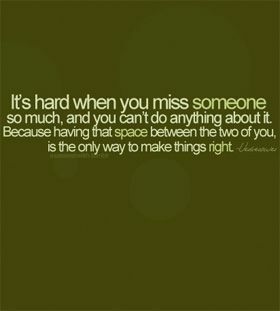 Sometimes, it's not just about missing someone, it's wondering if they're missing you too. It is a very disheartening and painful feeling to miss someone. You will miss someone only if you have a lot of affection and love on her or him. Even one minute will seem to be very long and an hour when you miss someone. The flowers, nature, sunshine, fragrance, spring rainbow and all other things will not bring in happiness and solace when you do not have the person dear, near you. It is similar to the situation of a fish being out of water .Lamartine rightly said, “Sometimes when one person is missing, the whole world seems depopulated” But interestingly, when you miss someone, the affection grows more and more. “Absence makes the heart grow fonder” is one proverb. When you mis someone, they may appear in your dreams too because your heart and mind are filled with their thoughts all the time. Here is collection of quotes on missing someone. Read them they are interesting.